Whatever you’re planning to crochet there are a few factors to consider. You’ve already chosen your crochet pattern. You’ve most likely spent hours choosing the most gorgeous type of yarn. As well as trying and eventually buying a few different crochet hooks. Now it’s time to put your tools to work and learn some different crochet stitches and techniques. There are advanced crochet stitches, and we’ll be looking at some of these later. But here we’re going to start with the basics. Whether your plans include crocheting a doll for your favorite grandchild, a scarf for your husband, or a blanket to keep you warm when the nights get cold, the basic techniques are all the same. Master these first, and the crochet world is your oyster. So, here goes with a brief explanation of some of the easy crochet stitches you need to learn. If you’d like to see the instructions in more detail, take a look here. Slip stitch – This will form the basis of most of your crochet projects in the future. You first have to make a loop with the yarn that looks like a pretzel. Through the loop you insert the crochet hook, and then pull the yarn at the bottom through it. Then you tighten the knot by pulling on the yarn. The stitch shouldn’t be too slack or too tight, but should be loose enough so that it can easily move on the crochet hook. Chain stitch – This is the second most important crochet stitch to master. It will form the foundation of many of the items you make. Holding the base of the slip stitch you’ve just created, wrap the yarn over the hook, from front to back. Now pull the wrapped yarn through the slip stitch. That is the first chain stitch you’ve made. 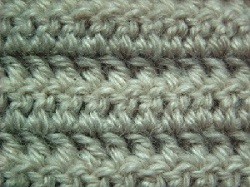 This stitch can be repeated as many times as necessary, in order to reach the required length. Single crochet – This is the next step following on from creating a line of chain stitches. Push the hook through the closest chain stitch, and wrap the yarn around the hook, from front to back. Pull it through the chain stitch and you’re left with two loops on your hook. Wrap the yarn over once more, and pull it through both loops. Half double crochet – One extra step and you’re doing the half double crochet stitch. Wrap the yarn, from front to back, and insert into the closest chain stitch. Wrap the yarn around again and pull it through the chain stitch. Now there are three loops on your hook. Wrap the yarn over once more and pull it through all three loops. Double crochet – Almost identical to the half double but once you have three loops on the hook, the yarn is wrapped over twice, and pulled through two loops each time. Triple stitch – One more easy crochet stitch to master and it requires you to wrap the yarn over the thread twice, from back to front. Then insert the hook through the closest chain stitch. Wrap the yarn over once more and pull it through. You should have four loops on your crochet hook now. Wrap the yarn over and pull it through two loops at the same time, which makes three times all together. Fastening off – This is a very important technique to learn, or all your hard work will go to waste and simply unravel. You’ll have nothing to show for your efforts, apart from an untidy pile of yarn. Once you’ve completed the required number of rows it’s time to secure the last stitch so it doesn’t come undone. Cut the yarn and allow about 12 inches, or just over 30 cm from the loop on the hook. Bring the yarn over the hook and draw the end, sometimes know as the tail, all the way through the loop on the hook. Pull tail to tighten and the last stitch is secured. One tidbit of advice when it comes to counting stitches. All too often you’ll find yourself interrupted when crocheting, which can be a bit of a problem when you’re trying to make a chain and count your stitches. A simple way to reduce the likelihood of this happening is to write down the number of stitches you’ve made on a piece of paper. Try and keep your chain stitches to increments of ten, and just make a check mark on the paper for every ten that you make. Continue until you’ve recorded the required number of stitches. If you’re a beginner, our advice is to practice by making some test swatches. As you learn, so you will hone your technique, and while this is happening tension may vary. A test swatch is a great way to practice certain stitches, without actually trying to make anything. Practicing how to make the stitch will help you to figure out a preference on the tightness of your stitch.